Incorporated into EU law by the Treaty of Amsterdam, Article 7 TEU is considered to have been both a gesture prompted by the future wave of EU enlargement and an attempt to tackle the discrepancy between the democratic model promoted by the EU in its external relations and its modest capacity to intervene whenever democratic values are at risk of being violated within one of its Member States. Following the notorious “Haider affair”, the provisions of Article 7 TEU have been extended to situations when there is a clear risk of a serious breach by a Member State of EU values. This new paragraph added with the Treaty of Nice therefore enables – besides the reactive approach of which Article 7 initially consisted exclusively – a prevention mechanism aiming at facilitating EU intervention before the breaches actually occur. The intention to use the Article 7 TEU mechanism has come about on several occasions. The French Roma expulsions, the Romanian political struggle between President Băsescu and Prime Minister Ponta and its consequences are amongst the most relevant examples. Furthermore, the European Parliament has recently highlighted its willingness to activate this democracy protection mechanism if the Hungarian government does not take action to restore the rule of law in Hungary. Nevertheless, the political unwillingness to use Article 7 leaves several questions unanswered: what are the precise EU values protected by this mechanism? What is the threshold for a measure or a non-measure to classify as serious breach?, etc. 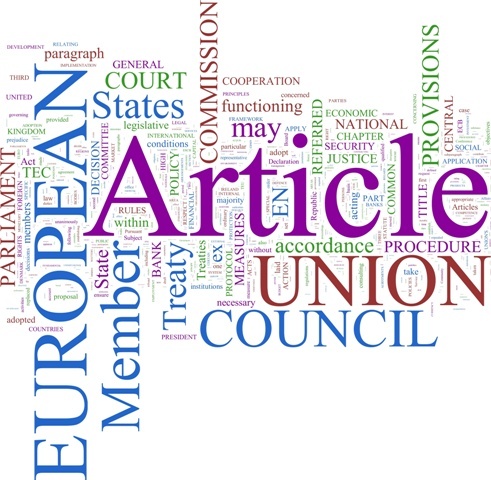 This Library Keysource is a collection of documents which examine the evolution of article 7 TEU’s provisions, investigate the several events that could have led to their activation and tackle the different article 7 elements that remain ambiguous or need further clarification. Brief section explaining the steps and the actors involved in the suspension procedure set out in Article 7 TEU. While thoroughly analysing the first two paragraphs of this article, the author focuses both on the early warning mechanism, introduced by the Treaty of Nice, and on the actions MS can take in case serious and persistent breaches of the values on which the EU is founded are determined. Working paper tracing Article 7 TEU’s origins and highlighting it as part of the institutional reform anticipating the two Eastern enlargement waves. Identified as a priority by the 1995 Reflection Group – whose work prepared the 1996 IGC leading to the Treaty of Amsterdam – the objective of “enabling the Union to work better and preparing it for enlargement” suggests the EU’s transition to more than just a common market, namely a unique international structure sharing common values. Les valeurs de l’Union européenne / Joël Rideau in Revue des affaires européennes, no. 2, 2012, pp. 329-349. This article aims at identifying and examining EU values and their protection by the EU and national courts. Composed of a chapter dedicated to each of the following values: human dignity, equality, freedom, democracy, rule of law, respect of human rights; this paper also concentrates on the process of constitutionalisation of the EU. The EU’s governance transfer / Vera van Hüllen and Tanja A. Börzel, Working paper – Freie Universität Berlin, 2013, 22p. The authors focus on the contrast between the EU’s external commitment to protect and promote democracy, human rights, the rule of law and the rather weak internal instruments designed to respond to breaches of democratic standards and human rights in EU Member States. They conclude by noting that the governance transfer in terms of protection of EU values at internal level is more modest than the governance standards it manages to transfer in the context of its exterior relations. Protecting the fundamentals: article 7 of the Treaty on the European Union and beyond / Cesare Pinelli, Foundation for European Progressive Studies, 2012, 20p. This paper tackles the three different alternatives the EU has at its disposal in order to intervene in cases of EU values violations: citizens’ applications before their national courts, which might refer to the CJEU for a preliminary ruling; infringement actions of the European Commission and monitoring mechanisms aimed at enhancing Article 7 TEU’s mechanism. Safeguarding democracy inside the EU: Brussels and the future of liberal order / Jan-Werner Müller, Transatlantic academy paper series, 2013, pp. 17-18. According to Jan-Werner Müller, professor of politics at Princeton University, Article 7 TEU is more a political rather than a judicial instrument. In addition, he notes the contradiction between the possibility of applying a sanction mechanism and other EU core principles such as mutual trust and mutual accommodation. Le contrôle par l’Union européenne du respect de la démocratie et des droits de l’homme par ses Etats membres : à propos de l’Autriche / Emmanuelle Bribosia, Olivier de Schutter, Thierry Ronse and Anne Weyembergh in Journal de droit européen, no. 3, 2000, pp. 61-65. This article gives a very good overview of the possibilities envisaged by the scholars in order to tackle Austrian threats to the EU’s democratic values at the time when the Freedom Party (‘FPÖ’) and Jörg Haider rose to power. Austria and the European Union – the report of the “three wise men” / Alison Duxbury in Melbourne Journal of International Law, vol. 1, no. 1, 2000, pp. 169-174. This article includes a thorough analysis of the report submitted in September 2000 examining the Austrian Government’s commitment to EU values. Jörg Haider’s Freedom Party (‘FPÖ’) – a right wing populist party – having entered the Austrian Government, it faced widespread criticism related to the discriminatory nature of their proposed reform of immigration policy. It is noteworthy that this report favours the introduction of a prevention mechanism aiming at moving away from a simple reactive approach. This alert procedure is currently defined by Article 7(1) and was introduced by the Treaty of Nice. L’affaire des Roms: a challenge to the EU’s area of freedom, security and justice / Sergio Carrera and Anaïs Faure Atger, CEPS, 2010, 21p. Criticising the ex post nature of the measures that can be adopted under Article 7 TEU, the authors of this paper also highlight the lack of a proper monitoring mechanism which would prevent a situation like the Roma expulsions in France. EP motion for resolution adopted in July 2013 calling on Hungary to reform its Constitution to bring it in line with EU norms and values. Point 86 of the motion for resolution shows the EP’s intention to activate Article 7 TEU’s mechanism in case the Hungarian authorities do not comply with the Union’s values. Article discussing the possibility of invoking Article 7 TEU in order to intervene in Hungary’s controversial, yet domestic, affairs. Focusing on the Hungarian case, the author also tackles the political legitimacy of European political integration. Furthermore, he analyses whether the provisions of the new Hungarian Constitution can be considered as clear risks of a serious breach of EU values, as defined by Article 7(1). Romania’s democracy in reverse gear – en garde, EU! / Corina Stratulat and Paul Ivan, European Policy Center Commentary, 2012, 2p. EPC Commentary highlighting MEP Markus Ferber’s threats to initiate proceedings in order to suspend Romania’s vote in the Council as a consequence of the undemocratic implications of the political struggle between President Traian Basescu and Prime Minister Victor Ponta. With this working document the EP highlights the fact that 2012 was marked not only by an economic, but also by a democratic crisis in some EU Member States. Furthermore, MEPs mention the lack of political will to activate article 7 TEU’s mechanism and the necessity to create a new mechanism in order to ensure the respect of EU values. With this Communication, the European Commission greeted the modifications brought up by the Nice treaty to Article 7 TEU. Interestingly, the Commission also insisted on the number of complaints it receives from European citizens underlining the fact that the latter interpret Article 7 TEU as a means of remedying the fundamental rights breaches they experience. In addition, this Communication includes clarifications about concepts such as: “clear risk of a serious breach”, “serious breach” and “persistent breach”. The President of the European Commission notes threats to democratic principles present in some EU member states and regrets the limited number of instruments the EU has at its disposal to fight such phenomena. President Barroso sees Article 7 TEU as a “nuclear weapon” and pleads for an alternative between this sanction mechanism and the usage of “soft power” tools. Amnesty International response to the European Commission Communication on Article 7 of the Treaty on European Union / Amnesty International, 2003, 6p. Amnesty International welcomed the Commission’s communication and its commitment to monitoring and addressing breaches of fundamental rights in the EU but was particularly concerned by the conclusion that “The Commission is convinced that in this Union of values it will not be necessary to apply penalties to Article 7 of the Union Treaty and Article 309 of the EC Treaty“. International mechanisms for protecting democracy / Theodore J. Piccone, Democracy Coalition Project, 2004, 31p. While identifying and briefly analysing democracy protection mechanisms that exist in regional agreements around the world, the author also compares the key elements of democracy clauses and tries to offer a model of such clauses integrating the best practices in the field. The five elements that a democracy clause should contain according to Theodore Piccone are: the incorporation of democratic norms in the organisation’s core mission, the nomination of an expert committee to monitor the respect of democratic principles; the clarification of the consequences in case of breach of democratic values; the institution of economic, trade and financial sanctions in such cases and the setting of a time frame within which the government concerned should restore democracy. The whole EU is a joke! The western EU members mop up the eastern member’s company, the economy, and pay for it, and if they don’t agree in something, the punish them. Bastards. A few years and the eastern countries will exit the EU, and you should think, where you will sell your trademarkt, if a 70.000.000 choose another asian market, where is cars , electronic goods too. You must think about zhe hungarian minoritys rights, whose problem hasn’t resolved in romania, and you western gifted Transylvania to romanians, where they were the migrants to Hungary when fleed from the turkish empire in the 17-18 century.